The day after the Super Bowl, you might have an annoying European friend or co-worker tell you he's unimpressed. He'll say how football is filled with commercials and downtime and Beyonce instead of game action, how the third-quarter brownout is an embarrassment to American infrastructure, how it's ludicrous that a domestic league winner can call itself world champions. You can just show him this to shut him up: hundreds of soccer matches, most of them in Europe, were found to have been fixed by a Singaporean crime syndicate. At least American sports are legit—except for when the league cuts the Superdome power to halt a blowout and the loss of ad dollars. 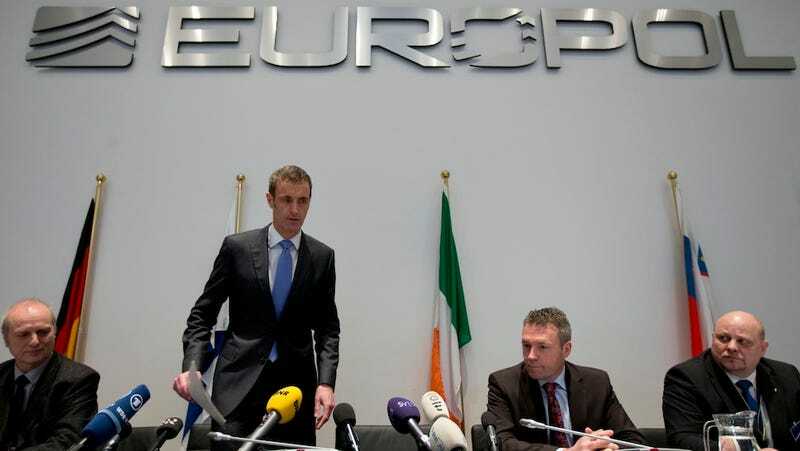 Europol, the E.U. 's joint police force, announced preliminary results of their years-long investigation. They found 680 suspect matches, 300 of them in Europe—including World Cup qualifiers, Euro qualifiers, and even Champions League matches. Investigators have identified 425 players, match officials, and others who were in on the match-fixing, and millions in bribes and bets that changed hands. [Wainwright] did confirm it had taken place in the last three to four years and admitted it was not a country under particular scrutiny. He added: "The focus has been on other countries, not the United Kingdom. However we were surprised by the scale generally of the criminal enterprise and just how widespread it was. "It would be naive and complacent of those in the UK to think such a criminal conspiracy does not involve the English game and all the football in Europe."